The Lady Boys of Bangkok return to Aberdeen Beach Links for another sizzling and seductive production. Their new 2018 show is entitled 'Wonder Women' to get you hot under the collar! This celebrates their 20th anniversary tour. 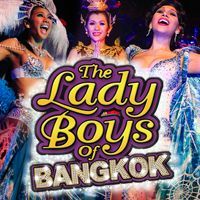 They will set the stage on fire with their fabulous mix of fun and frolics and this blazing hot production includes 16 of Thailand's most beautiful and intriguing lady boys, performing a show like no other! There are over 200 uniquely designed costumes ranging from feathers to designer couture, all demonstrated in cheeky dance and performance to a range of music such as film hits, pop and even country and western. There is also a fully licensed bar and a resident chef cooking a range of authentic Thai cuisine. It all takes place in their Sabai Pavillion at the Beach Links from Friday 13 July to Saturday 28 July.